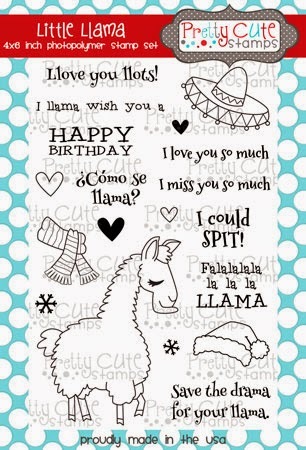 Karla Yungwirth Designs: Pretty Cute Stamps Feature - Llama Birthday Card! Oh my gosh, have you seen this Pretty Cute Stamps Little Llama stamp set?!! Too cute!! I recently made this card for a friend's birthday and totally had to share it with you! For my background I used a sheet from the Kaisercraft Base Coat Christmas 6x6 paper pad and heat embossed the snowflakes from the Pretty Cute Stamps Christmas Cheer stamp set. I have used these snowflakes so much already! I stamped this sweet little guy on kraft cardstock and coloured him in with coloured pencils. The hearts are included in the set as well and I coloured them in with gel pens before layering them over the vellum banner and inside the card. Of course, I'm a big fan of stamps I can add details on with, such as this cool scarf - perfect for a winter birthday! I coloured it in with markers and added some white gel pen dots before popping it up with foam dots. I just love this sentiment...! I stamped the front on vellum so I didn't cover up my snowflakes. I love that this Little Llama stamp set can be used for so many occasions!! How cute is this card? I just love the way you colored the image, and the scarf popped up on foam dots adds great dimension. Fun!!!! Thanks for propping this on our doorstep at 613 Avenue Create! This llama with his cozy scarf is adorable. Love the background and the way he looks coloured on kraft. The vellum adds a frosty feel to this fun card. Thanks for playing along with our Baby, It's Cold Outside challenge at Craft Your Passion this week. I hope we see you again soon.